Tuk-tuk (ตุ๊กตุ๊ก or ตุ๊กๆ) is a very popular way of getting to your destination inside the big city of Bangkok. It represents agility, cost effectiveness, customizability and openness (because it has no closed doors or windows). 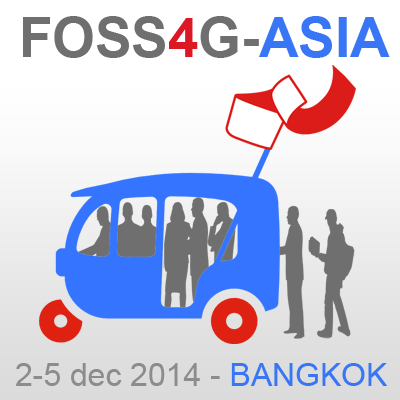 It is an efficient and rather convenient mean of transportation which is used daily by citizens.Holding the traditional FOSS4G ribbon, the FOSS4G Tuk Tuk logo was created by the FOSS4G-ASIA Organizers (original idea by Venka and Nick at the recent FOSS4G-Europe conference in July 2014) because it evokes both the city of Bangkok (or Thailand and Asia in general) and the type of “old-style” FOSS4G event it is organizing. The many people inside the tuk tuk also refer to the growing open source geospatial community, and to how it is good at sharing things, ideas, software and data, also in Asia. Register to FOSS4G-ASIA, reach Bangkok (by air, ship, train), hop on to a Tuk Tuk and head straight to Asian Institute of Technology to join the vibrant FOSS4G Asian community! 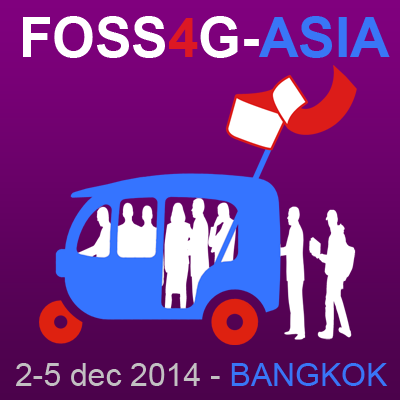 These logos are made available for the promotion of FOSS4G-ASIA 2014 conference. Please link to the conference from your website or blog. If you have questions about the use of the logo, please contact foss4g.asian@gmail.com.